Jon McLaughlin says Sunderland should be doing better in the League One promotion race. The Black Cats keeper was again in inspirational form against Scunthorpe United, making a string of fine saves before being finally beaten in the dying moments by a stunning Adam Hammill goal. The Scot says the Black Cats are not far from launching another winning run but called for improvement at both ends of the pitch. “It’s massively frustrating when you look at what – as a team and as a club – we’ve got here,” he said. “We should be doing better than we are doing. “We’re not in a bad place – we’re on another unbeaten run – but we’re not killing games off and we’re not keeping teams out. At both ends we could be doing better. “It’s fine margins but Saturday was another 1-1 draw and we’ve hard four in our last six. If you change those over we’d be in a fantastic position but you’ve got to earn that. “Scunthorpe are in a good position at the moment and they’ve turned things around. They came with confidence as all teams seem to do against us – they come with a swagger and a confidence. 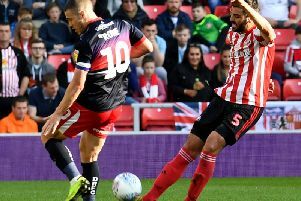 Sunderland’s eleventh draw of the season reflected another failure to land a killer blow after taking a hard-earned lead in a game. McLaughlin believes Sunderland’s attacking strategy is the right one for their squad but insists the Black Cats must be more ruthless. “There are different ways of getting a result and I’ve played in teams where we have just sat in and not been anywhere as talented as this group,” he said. “We’ve been the underdogs and had to sit in, absorb pressure and be very hard to break down. We’d have men behind the ball constantly and be very frustrating for the other team, spoiling games and trying to nick something when we get it. “This team has the talent to go and boss teams and be on the front foot for 90 minutes, to dictate to them. If you can do that and get goals, you can win games that way. “At the moment we’re not getting the second and third goals that sometimes we’ve deserved in games where we’ve really dominated the play and you always leave yourself susceptible to a counter-attack or an opportunity. Teams always create chances. “We’re happy to do that work when we know we’re going to be busy. We’ve just got to have that mentality that we’re going to keep the ball out of the goal at all costs. “Teams are going to keep coming at us. They want to perform. “We’re going to keep playing for 90 minutes or whatever it is and we have to keep going – as a defensive unit, as a whole team at both ends of the pitch,” he added. The draw saw Charlton and Barnsley close the gap on the top three but Sunderland remain in a strong position. So McLaughlin remains upbeat and believes his team can kick on in the coming weeks. “The most frustrating part is that we’re not actually losing a lot of ground because Portsmouth have been losing games and other teams are dropping points in and around us, so nobody’s running away,” he said. “That’s the most frustrating thing – if we could turn those draws into wins, we’d be sitting in a fantastic position but it’s the same for everyone. Everyone can beat everyone and that’s why you don’t see teams running away with it. It’s a long season and there’s still a long way to go. We’re just over halfway. “We’re not satisfied with where we are but we’re happy with what we’ve done so far. We know we’re one of the only teams with a lot more to give and we can improve quite significantly. Other teams can’t say that.